Your feet are the foundation of your body and if they are strong, you are less likely to have common running injuries. Arch height is almost meaningless if your feet are strong. Many world class distance runners have very low arches and massive “overpronation”, but their feet are strong! If you listen to the physiotherapy/orthotic industry, there is an epidemic of flat feet. The BTR coaching community have lost count of how many clients have visited us and claimed that they have flat feet. I only remember two clients with flat feet from the many 100’s of pairs of feet I’ve seen. Of clients claiming flat feet, some may have natural feet, but many present high-arched feet, the opposite of what they think they have (read our earlier post good, bad, ugly part 3 feet for our definition of natural, flat and normal feet). A widespread belief is that persons with flat feet are at increased risk of injury. Cowan (1993) studied US Army Infantry trainees over a 12-week training program and evaluated the risks of exercise-associated injuries among men with flat, normal and high-arched feet. The results showed an association between arch height and risk of injury. The 20% with the flattest feet were at the lowest risk! The higher the arch, the higher the risk of injury! This should not have come as a surprise to Cowan if he was familiar with the Hoffman (1905) study. 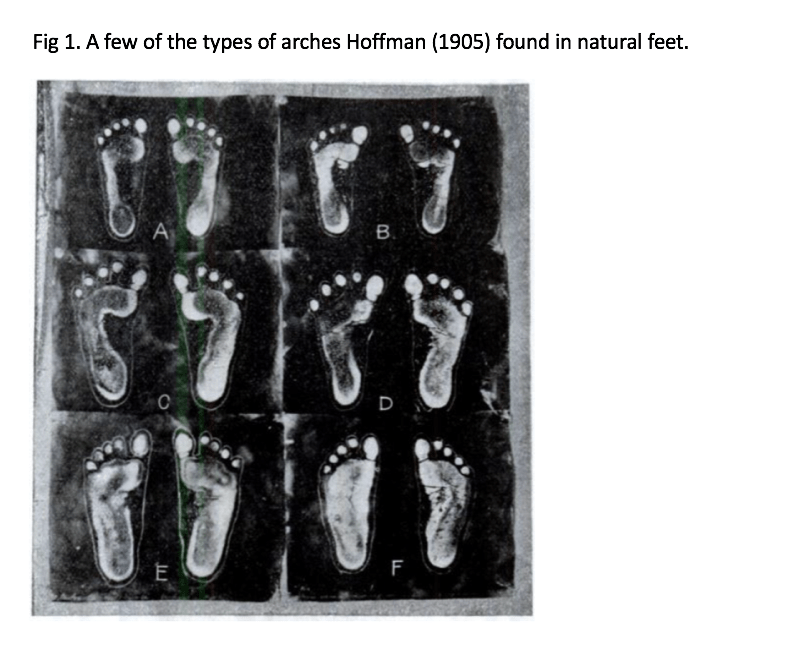 Hoffman studied unshod populations in Asia and Africa and found that “The height and shape of the longitudinal arch have no bearing on the strength or usefulness of the foot. The height of the arch appeared to bear no relationship to the gait. In shoe-wearers, the affection commonly called ‘flat-foot’ is often associated with more than ordinary eversion (pronation) of the foot on standing and walking. This eversion is due not to the low arch, but to the associated weakness or stiffness of the joints of the foot and weakness of the muscles”. See fig 1 for the variety of strong, flexible and functional feet that Hoffman found in unshod populations. Weak, inflexible feet are the problem, not height of the arch. A Natural Foot is strong and elastic and provides a wide, stable platform for all functional-human movements including; standing, squatting, lifting, walking and running. A Natural Foot will often be incorrectly misdiagnosed by medical professionals as a flat-foot. Cowan DN. (1993). Foot Morphologic Characteristics and Risk of Exercise-Related Injury. Archives of Family Medicine, 2, 773-7. Hoffman, P. (1905). Conclusions drawn from a comparative study of the feet of barefooted and shoe-wearing peoples. The Journal of Bone and Joint Surgery, 3, 105-136.